Ah...the good ol' Company Holiday Party. (or Non-Denominational End-of-Year Celebration, or whatever people are calling it these days...) We all know there are certain rules, written and unwritten, that party-goers should follow - this is a COMPANY party after all. Bosses will be there, and so will Human Resources! And no matter what anyone tells you, what happens at the company holiday party definitely does NOT stay at the company holiday party. As a caterer and event producer, we follow some rules of our own. Rule #1 - serve the best food our guests have ever had at their party. Rule #2 - deliver service that far and away surpasses their expectations. Rule #3 - don't be boring. And that rule applies across the board! We've got to keep our clients and their guests entertained - it's supposed to be a party, right? So when we have the opportunity to design and produce the entire event, not just the catering, we love to put on a great show. 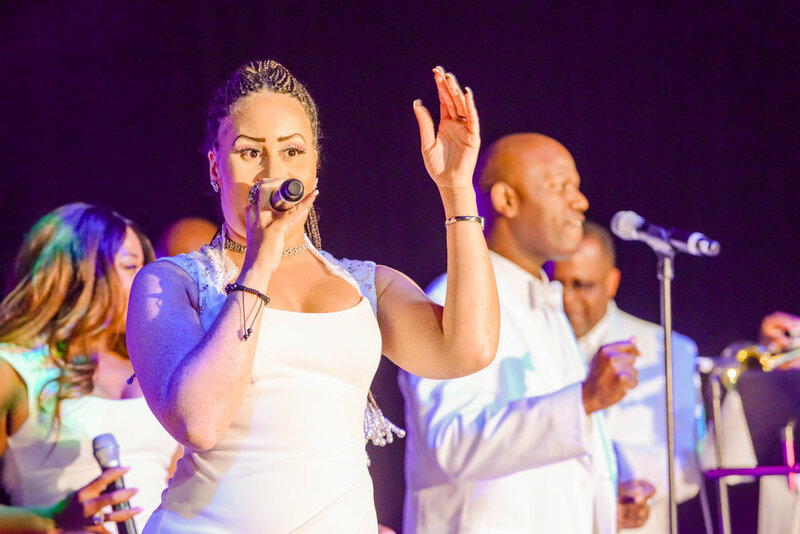 For two clients on back-to-back nights, we brought together music, dance, and performance that celebrated their shared "Winter in New York" theme. On the first night, guests danced to the beat of a different drummer. Literally. A club-style DJ played with a percussionist, saxophonist, and guitarist, mixing live music with house, dance, Top 40 and classic hits. On the second night, a 13-piece live band came in from the East Coast, and rocked their way through soul, Motown, classic rock, Top 40 hits, and everything in between...and did it for three hours without taking a single set break! Breakdancers performed around the room, NYC street-style with giant boom boxes and cardboard taped to the floor. On cue, they came together on the dance floor for a choreographed performance that had every phone in the joint pointed at them for the inevitable social media posts. For fun we added some other performers including a "Living Tree" and Rockettes-inspired dancers. As guests entered the party, they stopped in their tracks as a giant tree came walking toward them. Perfect photo-op and #selfie explosion! "Snow-dusted" leaves and bare branches gave us the wintry weather vibe we needed. For the transition from pre-reception to full party began, high-kicking ladies took to the dance floor for their own choreographed number, set to a funky remix of Frank Sinatra's "New York, New York". Then the dancers made their way to the main stage, dancing in formation, then splitting in the middle to create the perfect intro for the husband-and-wife team of CEO and Chair of the company foundation. The two of them loved it even more than the crowd, and the dancers formed a great backdrop while they welcomed their employees and guests to the party. For a few hours on two nights, WestWorld of Scottsdale became Manhattan in December - and fun was had by all! CLICK ON THE PHOTOS BELOW TO CHECK OUT OUR SLIDESHOWS! — Every Event Planner. Ever. So excited for the upcoming Wedding and Event Season here in the Valley of the Sun! M Catering (and the entire M Culinary Concepts family of companies) is Open For Business To Everyone!